A great pitcher can throw flaming fastballs, and Snoop Dogg is an expert at dropping things like they’re hot, so you’d think the rapper would be a natural ballplayer. You’d be wrong. 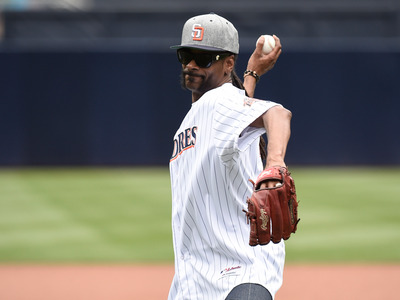 The rapper threw out the ceremonial first pitch at a San Diego Padres baseball game on Wednesday night, and it was just awful, folks. Like, it was a real stinker. The ball went wildly, comically off to the right and almost beamed an unsuspecting cameraman. At least the 44-year-old seemed pretty chill about it. A smokey Instagram video selfie he posted at the game might explain why. Snoop now joins an exclusive club of famous musicians who have thrown god-awful first pitches. It’s up for debate, but his effort probably ranks somewhere between Carley Rae Jepsen’s ground ball and 50 Cent’s infamous wild pitch.